St Lucie Inlet my auto pilot malfunctioned. If it had not been for little Robbie who said, "Pop Pop should we be going there?" We could have had a problem. We were idling slowly but headed for the jetty rocks. I turned away in time and we went on for a pleasant day. hand lines, used beer bottles for sinkers and used pork rind for bait. We caught a small fish, cut it up for bait and caught some nice Cod Fish. This picture was at our home in Seagate Harbor, Florida that we moved to in Nov. 1971. Ann and I took our mothers fishing up the North Fork of the St Lucie River for Snook. Cooked Snook for dinner. They enjoyed the experience so much. In 1973 we moved to Hidden Harbour, a Mobile Park where you owned your lot and paid taxes. We had a 24 by 60 Ft. mobile made by Tropicaire and had it put on our lot with 24 tiedowns on a concrete foundation (the only one in the park so installed). 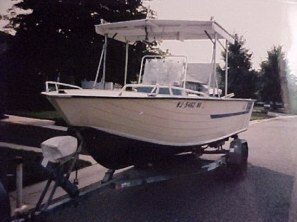 While there I bought my third boat, a 13 Ft. Del Que Dory with a 20 HP Merc. Outboard. See my King Mackeral catch in Fishing 2 Page for the catch of a King Mackeral in this boat. If I find a picture of this 13 Ft. boat I will post it here. 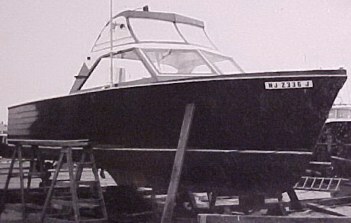 Fifth Boat, a 25 1/2 Ft. Dusky with a 160 HP Perkins Diesel Engine. The best boat I ever had for fishing. 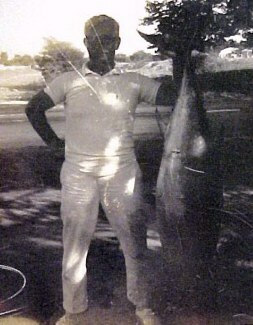 See Grouper Fishing in my Fishing Page. I installed automatic pilot, Loran unit and Ship to Shore Radios in all my boats. Equipment required to fish bottom out in the Golf Stream 15 miles off shore. Radios a must in all boats. Boat #6 was a used 21 Ft. Aluminum Star Craft with a 40 HP Merc. outboard engine purchased after we moved back to NJ. 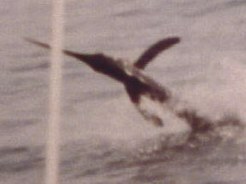 Many a time with no breeze to help drift my 10 HP motor helped catch fish when others lay still in the ocean. 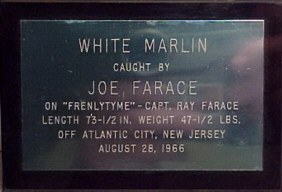 Phil Smith and I caught this 90 Lb Blue Fin Tuna off Asbury Park with the 23 Ft.
made this double seat for the Star Craft. 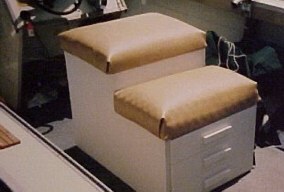 Tackle drawers and high seat for me under which were two batteries for engine, radio and recorder. I always had a seperate battery for the radio in case the boats electrical system had a problem so I still had a radio to use to get help. Any Ads that you may see here are without my knowledge or approval.